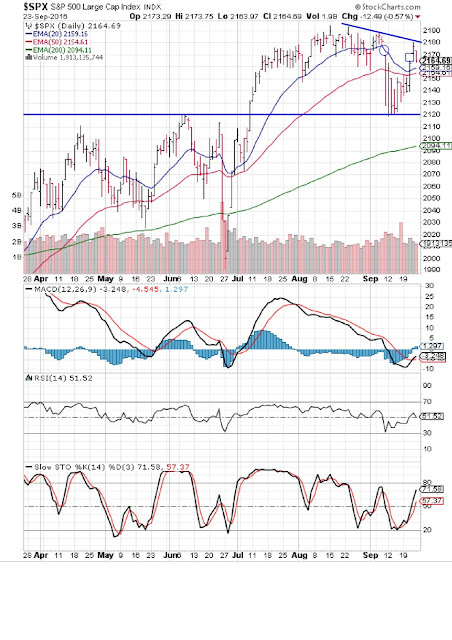 After receiving good support from the 2120 level, the daily bar Chart pattern of S&P 500 resumed its up move by crossing above its 20 day and 50 day EMAs and touching an intra-day high of 2180 on Thu. Sep 22. However, it faced resistance from the blue down Trend line and slipped down to close below 2165. The index gained 1.2% on a weekly closing basis and is trading above its three EMAs in a bull market. Should bears get ready to throw in the towel? Not yet. Note that the index formed an upward 'gap' of 8 points on Thu. (marked by blue square) and completely filled the downward 'gap' (also of 8 points - marked by blue circle) formed on Sep 9. The latter 'gap' had triggered a breakdown below a 'rectangle' consolidation pattern (see last week's post). Technically, filling of a downward 'gap' should lead to a resumption of the down move. But Thursday's upward 'gap' also got filled by Friday's corrective move. Shouldn't that lead to a resumption of the rally from the low of 2120? That can happen only on a convincing breakout above the down trend line - as per theory of trend lines ('a trend remains in force till it gets reversed'). Daily technical indicators are giving mixed signals. MACD has just crossed above its signal line but remains in negative zone. 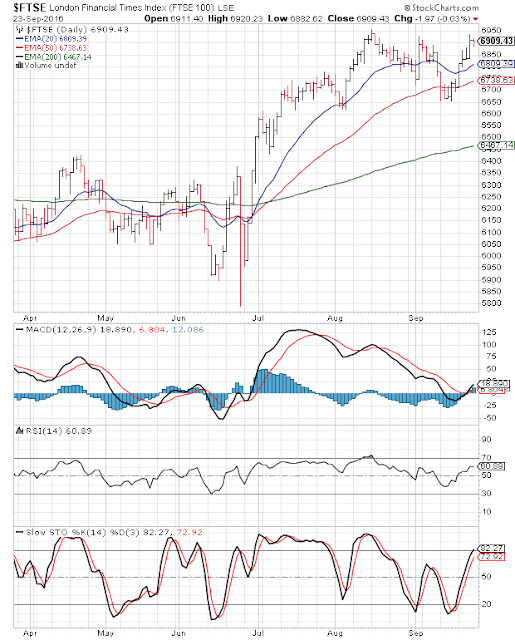 RSI is in neutral zone, seeking support from its 50% level. Only Slow stochastic is looking bullish by rising above its 50% level. Some consolidation can be expected before bulls can attempt a breakout above the down trend line. The longer the index consolidates between 2120 and the blue down trend line, the more bearish will become the technical set up. Why? Because a bearish 'descending triangle' pattern will then get formed near a lifetime high. That could very well be a trend reversal pattern. If you are holding long positions, take some profits off the table. Bulls better hope for a quick breakout above the down trend line. On longer term weekly chart (not shown), the index traded above its three rising weekly EMAs in a long-term bull market for the 29th week in a row. Weekly technical indicators have corrected overbought conditions but remain in bullish zones. The following comment was made in last week's post on the daily bar chart pattern of FTSE 100: "The Sep 2 top of 6928 needs to be crossed if bulls are to regain their control." The index rose to touch an intra-day high of 6937 on Thu. Sep 22 before closing with a weekly gain of 3%. However, the index formed a 'doji' candlestick pattern, which is a sign of indecision among bulls and bears. All three daily technical indicators are in bullish zones. The index is trading above its three rising EMAs in a bull market. The next hurdle to be crossed is the Aug 15 top of 6955 if bulls are to regain total control. On longer term weekly chart (not shown), the index closed above its three weekly EMAs in a long-term bull market for the 13th week in a row. Weekly technical indicators are looking overbought.